Hey there, everyone! Welcome to another Lawn Fawn inspiration post! Tonight we are featuring a new mini set called "Flying By", which features paper airplanes as the main images!! You will love this little stamp set!! By the way- did you happen to check out the Bright Side projects that were posted last night by our layout girls? If not, you should....they were amazing!! I thought this was perfect for a more clean & simple approach, and it has actually been awhile since I have done something more graphic in nature! I've kind-of been piling on the layers and product lately...so it is a nice change. Here is what I created! Instructions: Make card from kraft cardstock. Cut a strip of star paper, distress ink the edges and adhere to the left side of the card. Cut a block of kraft cardstock and adhere it to the right side, popping just the left side of the block with foam adhesive. 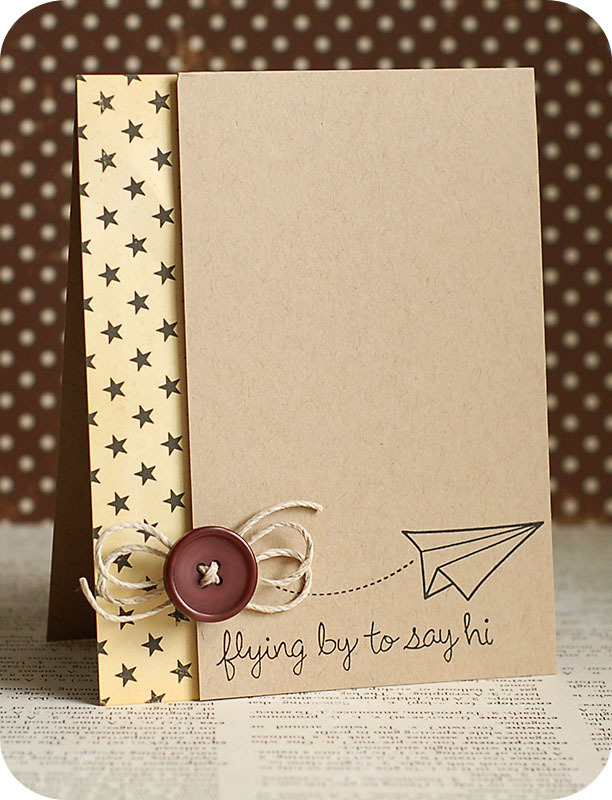 Stamp the flight pattern, paper airplane and sentiment to the bottom of the kraft block. Tie a double bow from twine, thread a button around the middle, then adhere to the left side of the flight pattern to finish. I hope that you've enjoyed my card for "Flying By"! Be sure to check out what the other designers have created as well! Be sure to check out the Lawn Fawn blog as well, because there will be lots of giveaways! I love this Lea. So simple and clean, but very striking.The button and twine are the perfect touch! This definitely illustrates that less is more. Your card is Beautiful. Thanks for joining us at One Stop Craft. Fabulous CAS card and I love that twine double bow! Love, love, love your twine and button embellishment and your whole card design is simply gorgeous! Such a awesome card! Love your take on the challenges and the added twine to the button is perfect! Incredible. I just love it. Perfect cas card. Thanks for joining us at Little Red Wagon. This is fabulous, but all of your projects are fabulous!!! I love how you can pull off the layered, shabby chic AND clean and simple. Your talents are so diverse. Your projects are always amazing! such a clean card. Would be nice for either gender, but esp. fab for a male! Wow! Your CAS card is fabulous! I love the paper strip with stars mixed with kraft and the ribbon and button! Perfect! Your card is simply perfect! Thank you for joining us at Creative Belli! This is FABULOUS Lea!! Perfectly designed!! Lea, as always. This is gorgeous! A perfect design!!!! Love it! Thanks so much for joining us at Lawnscaping! Very neat card. I love those stars and the twine. Thanks for sharing. Fab CAS card! Love it! What a perfect CAS card! That button placement is perfection. Thanks so much for playing with us at Lawnscaping! Awesome card....love your creative use of twine. Thanks for sharing at AnnaBelle's this week. Beautiful Cas creation!Thanks so much for joining us at AnnaBelle Stamps!